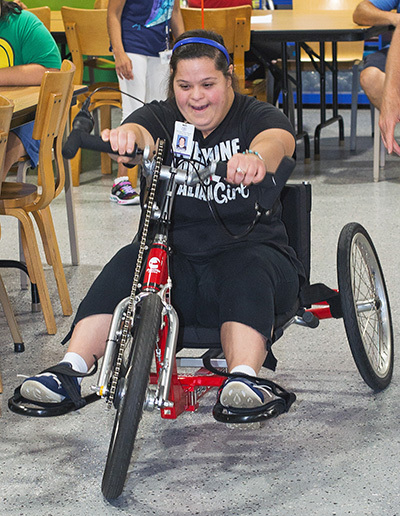 The Marian Center's Ashley Acoccella tries out the cycle. Marian Center student Valerie Virgil presents Anthony DiNito with a drawing of the cycle his non-profit donated to the school. MIAMI GARDENS | Students at the Marian Center couldn’t wait to ride a newly donated recumbent hand cycle around the administration building’s large day training room Aug. 29. 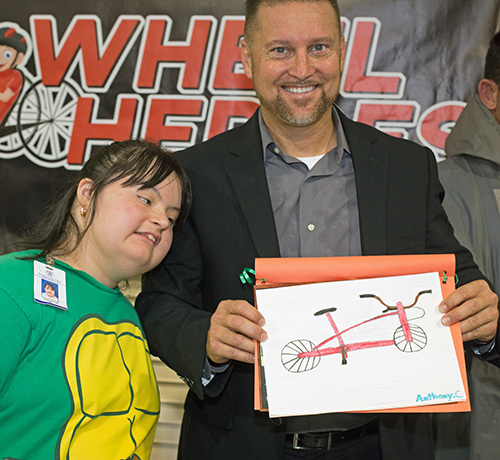 “I’ve been fortunate in my life, so I wanted to bring joy to other’s lives,” said Anthony DiNito, a realtor and founder of Wheel Heroes, a non-profit organization which donates specially-designed bikes for kids with lower levels of physical and mental abilities. Wheel Heroes seeks sponsors for the bike giveaways, with donors receiving incentives depending on the donation amount. The Everglades Bicycle Club, a non-profit that organizes bicycle rides to benefit charities, raised the money for the Marian Center cycle. DiNito’s charitable giving started in 1999, when he gave part of his realtor’s commission to Children’s Miracle Network, which benefits Miami Children’s Hospital. In 2013, DiNito took on a different mission after he found a new passion for cycling. He rode from Miami to Key West, raising more than $1,000 for “DiNito’s Ride for Kids” to buy special bicycles for disabled children. The Marian Center has several tricycles for students, but the new cycle gives students an alternative, providing hand-pedal steering, rather than leg-pedaling, a padded back support and better maneuverability. “It’s comfortable, soft and easy to get around with,” said Rafael Olivero after he rode the $1,700 red Pacific Handy 7 recumbent hand cycle around the room. The Marian Center’s executive director, Sister Lidia Valli, of the Sisters of St. Joseph Benedict Cottolengo, called the bike amazing after she went for a ride. “It’s a gift from God,” she said. 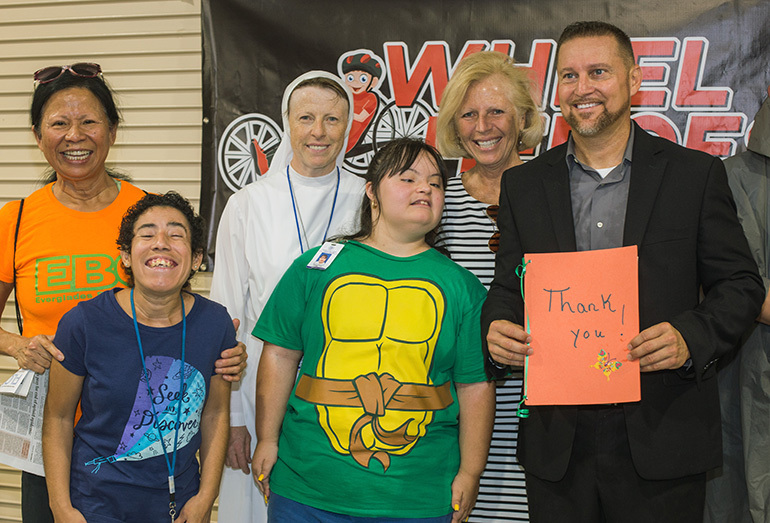 Marian Center students and staff thank the non-profits for their cycle donation. Posing, from left: JoJo Russo, Everglades Bicycle board member, Rosita Petreck, Marian Center student, Sister Lidia Valli, Marian Center executive director, Valerie Virgil, student, Sue Kawalerski, Everglades Bicycle Club president and Anthony DiNito, founder of Wheel Heroes. Thanks to Mr. Cliff Gibson who is always on the lookout to find friends and benefactors for the Marian Center family. Thanks be to God!